A head on collision on North Jefferies Blvd injured three people, one fatally, Tuesday morning 31-January. At 09:02, two Chevrolet SUVs collided head-on after a south bound Tahoe crossed into the north bound lanes and struck a Suburban. The collision caused heavy damage to both vehicles and trapped the 51 year old female driver of the Suburban in the wreckage. Her 27 year old daughter also received non-life threatening injuries. Click here for more information. 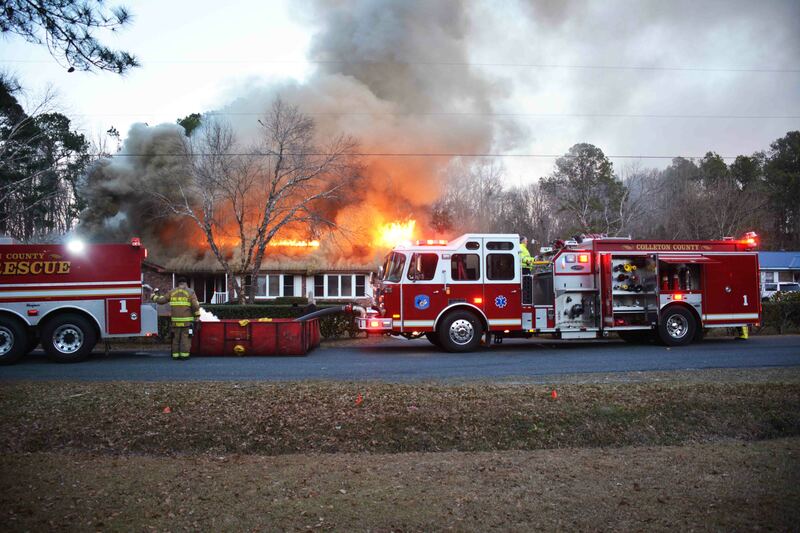 A Walterboro family was displaced following a structure fire at 212 Brights Court Monday afternoon, 30-January at 17:36. Callers to 9-1-1 reported the fire started in the area of the kitchen and had spread to the attic. Smoke and flames were reported to be coming from the attic. Car 107 arrived to find heavy smoke conditions from all sides of the approx. 4000 sq ft home with flames visible from the south end of the building. Click here for more information. A 53 year old Walterboro man was killed after he stepped into the path of an east bound dump truck on Bells Hwy at the intersection of Mount Carmel Road, Monday morning 30-January at 05:25. 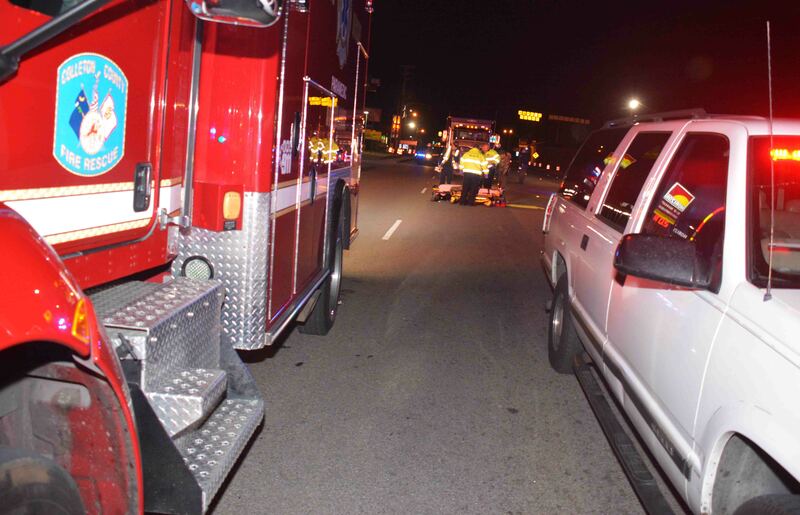 An off duty Firefighter-Paramedic drove up on the accident shortly after it occurred and began performing CPR on the man who was lying in the roadway. Medic 26 arrived minutes later and continued resuscitative efforts. Click here for more information. 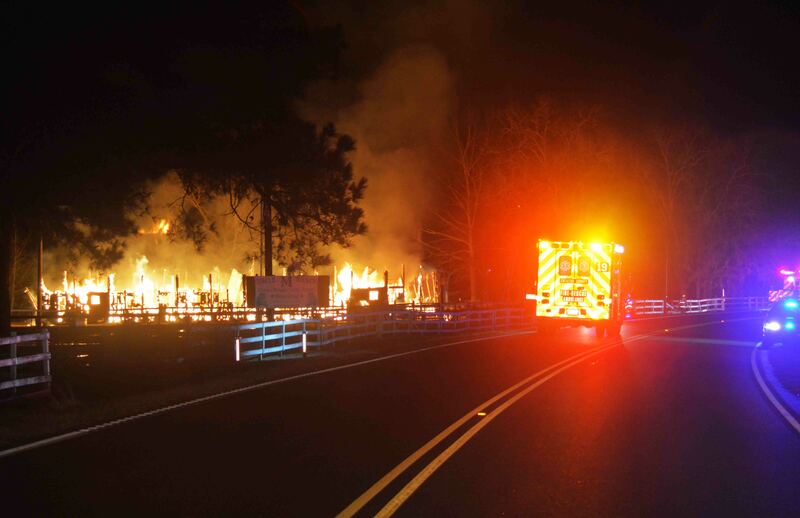 A large barn at Circle M Ranch located at 2927 Cottageville Hwy (US Hwy 17-A) was destroyed in an early morning fire 23-January. At 00:28 a passerby reported to 9-1-1 that the building was on fire and the roof have already collapsed. Fire-Rescue units arrived minutes later to find the approximately 4500 sq. ft. barn fully involved. Little of the building was still standing. Firefighters deployed multiple hand lines to combat the blaze. Click here for more information. 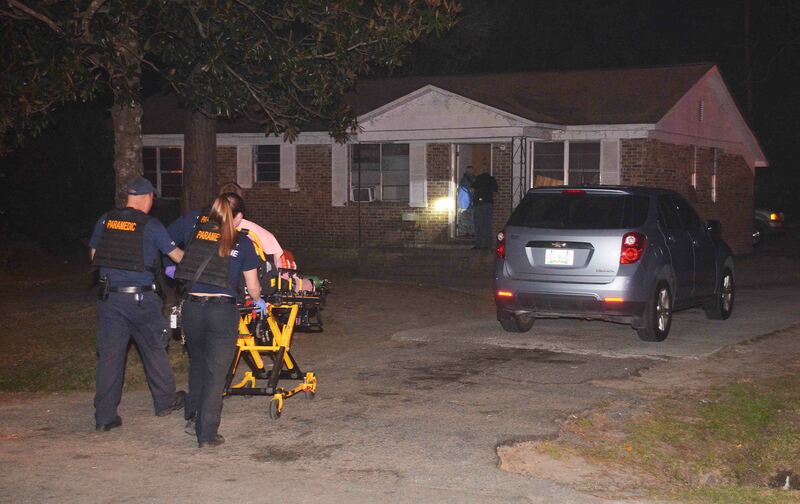 A 27 year old Walterboro man was shot in the leg during an altercation at 117 Grayson Street Tuesday evening 17-January. The incident was reported at 19:04. Sheriff’s Deputies cleared the scene prior to the arrival of Fire-Rescue Units. Firefighter-Paramedics found the man inside the residence with a single gunshot wound to the left leg. He was in stable condition. Click here for more information. Two people were injured in a two vehicle high speed MVC in the 12000 block of Green Pond Hwy (SC Hwy 303) north of Ivenia Brown Dr. Saturday morning 14-Janaury at 10:55. Both vehicles were traveling south on Green Pond Hwy when a Jaguar struck a Hyundai minivan in the rear causing it to flip over at least twice. 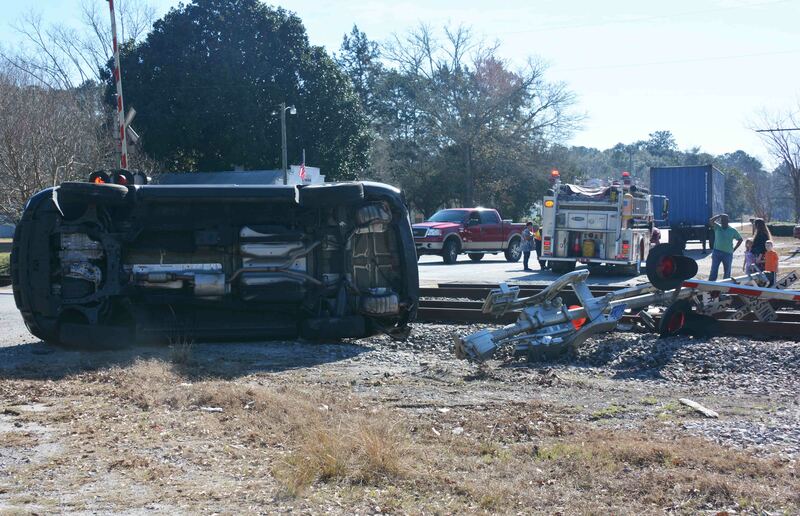 The minivan collided with the railroad crossing arm knocking it over, blocking the railroad tracks. Click here for more information. 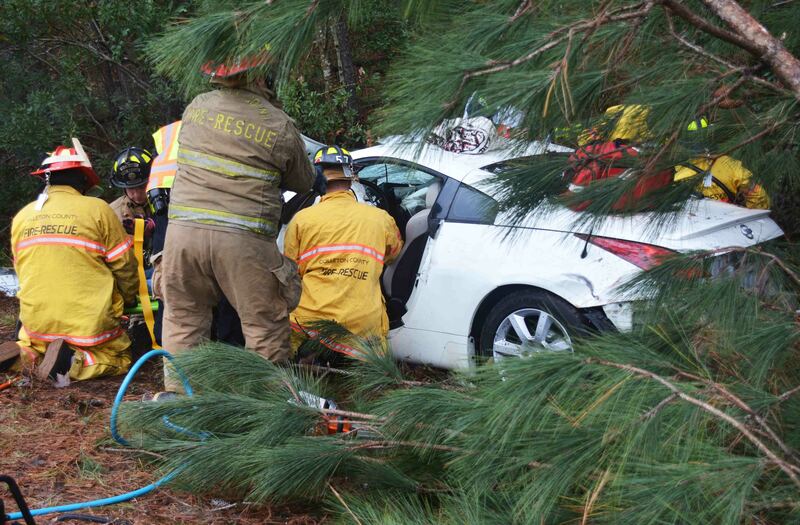 A 50 year old Hollywood woman was injured in a two car collision near the 7000 block of Green Pond Hwy. Friday evening 06-January at 18:57. According to witnesses, the vehicle was traveling southbound on Green Pond Hwy, when it encountered several deer in the roadway. The car broke hard, but possibly struck two deer and was then struck in the rear by another southbound vehicle. 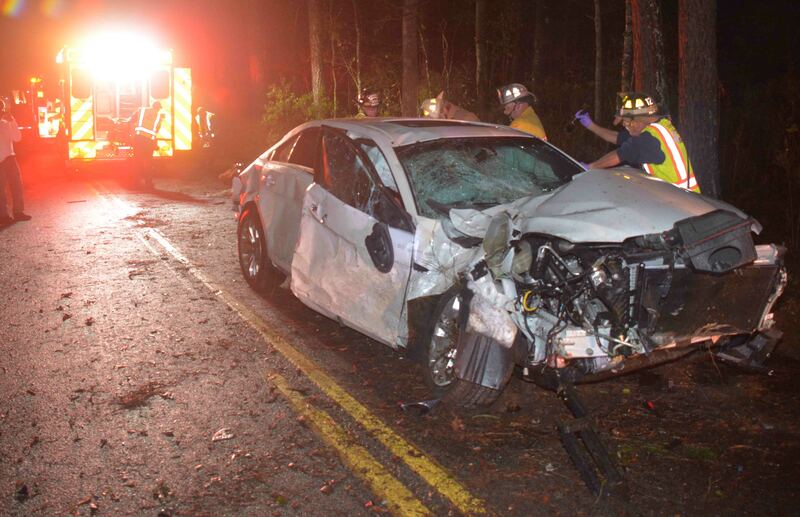 The impact sent the Nissan Altima in the woods where it struck an embankment and was wedged between several trees trapping the driver. Click here for more info. Click here to view our annual statistical report. OSHA Training for 2017 begins today. Click here for a complete list of training sessions available. All personnel must attend one session. 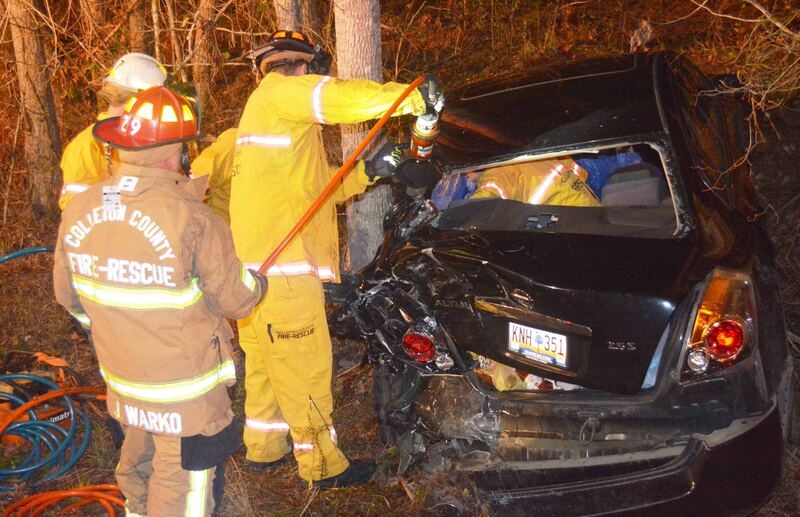 Two adult males were injured, one critically, in a single car MVC on Round O Road just south of Bodison Memorial Drive Sunday evening 01-January. The accident was reported at 22:24. It appeared the 2015 Taurus was traveling north bound, when it left the roadway at a high rate of speed and entered the southbound ditch. The car became airborne, then collided with a power pole and struck a block church sign. Click here for more information. 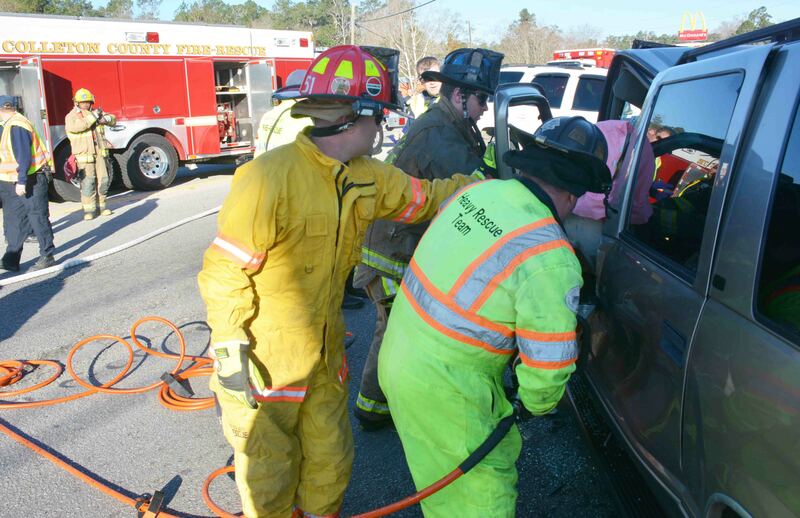 Two people were injured in a single car, high speed MVC on I-95 near the 49 mile marker northbound, Sunday afternoon 01-January at 14:42. The northbound Nissan left the highway and collided with a tree, breaking the top portion of the tree off, which then landed on the car. The vehicle received heavy damage, trapping the driver and then caught fire. Multiple other motorists stopped to assist and two used portable fire extinguishers to dowse the flames, possibly saving the driver’s life. Click here for more information.